The CGA is a leading resource for more than just golf. The Colorado Golf Association is proud to announce our new vision for the CGA as we prepare for the upcoming golf season. In 2018, our year of unification with the Colorado Women’s Golf Association, the CGA developed a new strategic plan outlining a shared sense of mission, vision and values. The new vision of the CGA is to serve as a leading resource for our 60,000 members, our 220 facilities, the state of Colorado and our peer organizations. The CGA is dedicated to preserving, improving and serving the game of golf in Colorado. We do this by being a forward-thinking, collaborative and inclusive organization. These values are rooted in the integrity found within the game of golf. To represent the newly developed, mission, vision and values, the CGA engaged Buffalo.Agency (Buffalo) – the fully-integrated marketing firm which represents golf, sport and lifestyle brands globally – to help the CGA through this unique transition and create a new logo for the CGA. Under the direction of Buffalo.Agency the CGA created a versatile, modern logo representative of all golf in Colorado. Ed Mate, Executive Director of the CGA shared, “the integration of the CGA and the CWGA was a monumental change and the logo needed to reflect it. 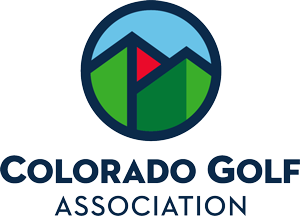 It’s a constant reminder we’re not the same organization, that we have a different, broader, more inclusive organization than we did a year ago.” The CGA’s new logo incorporates welcoming shades of blue and green representing sky, water and grass — inescapable elements of golf and Colorado’s natural beauty. The red flag in the logo shares a connection with the CWGA, the Junior Golf Alliance of Colorado and the USGA which recognizes the CGA as its “Allied Golf Association” for the State of Colorado. Completing this vision is our newly designed website www.coloradogolf.org. This interactive site developed by Synergy Innovative Systems, will serve as a dynamic platform to engage, support and honor golf in the state of Colorado. The CGA Member Zone has been expanded to provide golfers with a unique place to manage their game, support great programs and enjoy excellent benefits from local and national partners. New programs, events and discounts will be added throughout the golf season. We invite our members to log-in and stay tuned for more unique opportunities as CGA membership means more than ever before. For questions or comments about the new website, logo or general information, please contact Ryan Smith, Chief Development Officer, by email or 303-974-2108. Thank you for the continued support of YOUR Colorado Golf Association. Here’s to a great year for golf in the state of Colorado!